Hope Hughes is the founder of Ethereal Visions Publishing, LLC. She pulls from the artists, stories, and myths she loves to inspire and create beautiful products. Matt Hughes is the founding artist whose beautiful art breathes life into everything Ethereal Visions Publishing creates. 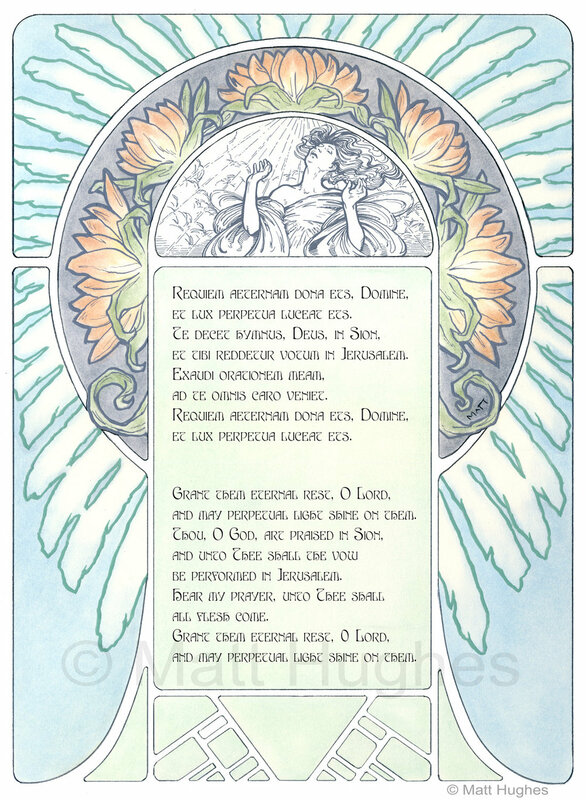 I recently interviewed Hope about their business and their latest project Mozart's Requiem, an illuminated manuscript Art Nouveau inspired 60-page book with 15 full-page illustrations, lyrics in Latin and English, a brief history behind Requiem. ﻿1. How did you get started in book publishing? I have always harbored a love for books. They were my escape as a child when I needed new worlds and people to enlighten me. They changed me - shaped me into a better person by exposing me to people and ideas that were different than my own. In a way, book publishing was a natural step for me once I let go of the expectations of the go get a good corporate job after college mentality. It waited there, patiently, until I decided to do what I love. This decision was made easier by a series of events that catapulted me into the business. I always knew that I wanted a business with my husband; one where we could publish his amazing art. We talked about it for years, but the rigors of life (home, car, insurance, bills, bills, bills…) kept the idea at bay. Matt had a good, secure corporate job and I tried my hand at personal training, health education, and podcasting. It was boring but secure and we always had the little idea of owning a business in the back of our minds. November of 2017, I left the career of health and decided to actually create an LLC after a successful (and highly problematic, but that is another story) campaign for a tarot deck. It was comfortable because I could take time and learn as I slowly built my company. I thought we’d start small and maybe publish a book a year and maybe some cards decks, but, boy, fate had other ideas. We bought a new home in a wonderful city and all was going well until Matt’s corporate position was cut. Here we are with a whole new set of debt and a new business. Not the ideal situation for anyone, especially when you’re middle-aged and new starts are difficult, to say the least. I was surprisingly calm (after the initial freak out) and decided that the business was already established and we could make it successful simply because it was a career that encompasses what we both love - art and books. This is the work we’re supposed to be doing. The world needs more beauty and creativity - that is the art. The world definitely needs more books - that is the publishing. 2. What kind of challenges have you faced as an independent book publisher? Money. Isn’t that always the issue? It’s been a hard fought battle with finding funding and shaking off the naysayers (I’ve been told far too many times that it’s impossible to make it as a publishing business), so we chose a non-traditional route. We fund our business by going directly to our customers. We create campaigns using the crowdfunding platform, Kickstarter. It’s a double-edged sword though. The pros are that we can create unique ideas and our supporters are involved with the project. The people who help us fund each project are absolutely one of the most important aspects of our company and we value each and every one of them. The success of each project relies solely upon them. There are no loans, no boards, no CEOs - we create publications for people in the hopes that it brings joy to them. The cons are that it is a scary venture as it always unsure because some projects are highly successful and some simply are not. Not an easy pill to swallow when you have bills to pay. Each campaign is time-consuming and costly for advertising, public relations, and exposure. It’s difficult to break down the barrier of the stigma that we aren’t a real business because we crowdfund and most places will write us off and not give us the time of day for advertising or interviews. We’re also a two-person team doing the job of at least 10. We’re getting better at what we do and managing the company and customer needs, but it’s not easy and we’re not always perfect with it. Shaking off negative comments and unhappy people can be challenging, but we focus on doing the very best we can and growing from the mistakes (not as simple as it sounds). Owning a publishing business is not easy, but it’s what we love and I believe in what we do, my husband, and the people who support us. 3. What's been a memorable Ethereal Visions Publishing career highlight? Getting the proof of the first book we’re publishing. Holding it in my hands knowing how much blood, sweat, and tears went into it. The joy and excitement of getting it into the hands of the family of supporters who helped make it a reality. This first little book made me realize that we can do it. Our family of supporters and those who help us create each project. Dr. Jackson Crawford, Katzi Roman, Tracey Higgins, Olga Harmsen, Erica Jeal, and Chris Semtner are near and dear to me because they took the time to help us make our projects successful. Every single person who supports us, lends encouragement, and shares our work. They inspire me to not give up and push on to the next project. They mean far more than they know. 5. Can you tell me about your creative process? How do you and Matt work together? We bounce ideas off of each other and see what sticks. We have extremely similar, quirky interests so most of the time it’s easy. I go into research mode and start planning advertising and social. I also create a list of experts that can help us with each project and create a board with lists, images, references, and contacts for Matt. Matt takes all of this and lays the foundation of the overall look and flow of each project. He is the soul of each project - birthing the images that make the project come to life. He is the artist, video content creator, and advertising designer all wrapped up in one person. We combine what we do to create posts and outreach for each project. Without each other, we would have nothing, but together we are creating something amazing. 6. In a world where digital is the norm and things are moving so quickly, why have you chosen to work on an old art form (illuminated manuscript, Latin lyrics)? I have a profound love for things that are handcrafted. These things have a soul and life to them where things created with the now, now, now feel lifeless and cold. My background is in music and I took classical Latin for three years in high school. The language is beautiful and stirs so much emotion when it is set to music. Mozart’s Requiem is one of my absolute favorite pieces to listen to and perform. I wanted this publication to convey the same raw emotion as the music. Matt’s style of art is perfect for Requiem - you get that otherworldly feeling when you view his art. I’m already working on the next project for next year. We’re planning on an illustrated edition of Mary Shelley’s Frankenstein and it’s going to be stunning! 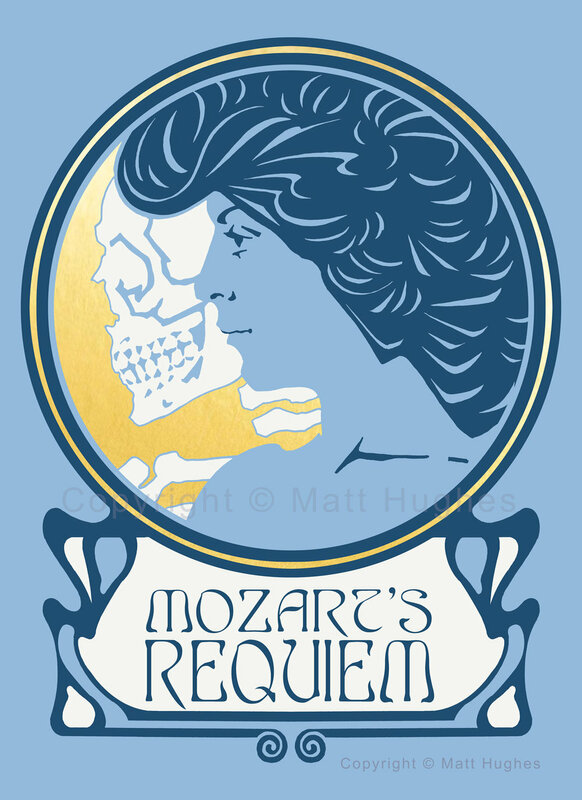 You can support the Mozart’s Requiem Kickstarter here. There’s also a referral program where Ethereal Visions shares 10% of profits with people who help to boost their campaign. If you’d like to keep updated on the progress of Mozart’s Requiem or any upcoming projects, follow along on Facebook, Instagram, Twitter.